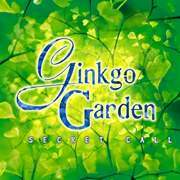 About GInkgo Garden: "Secret Call"
The Ginkgo Tree, also known as the Maidenhair Tree, is a master in the art of surviving. Its existence is estimated at over 250 million years and is believed to be the oldest tree on the planet. Amazingly, it survived the nuclear blasts of Hiroshima and Nagasaki, being the first plant there to re-foliate without any signs of deformation. Because of its vitality, it has long been regarded as the "bearer of hope." The symmetric fan-shaped Ginkgo Leaf ("biloba") is frequently compared to the Asian symbol of Yin and Yang and often represents love and sometimes things seemingly opposite: "one and double." The one leaf representing "oneness" with the two sides of the leaf, a symbol for how two people can be so connected spiritually that they become one ("One And Twain").The plant has been heralded for its medicinal purposes for thousands of years and lately has become quite an enterprise in the health trade. The German poet Johann Wolfgang von Goethe was so fascinated by the Ginkgo Biloba and what it represented, that he wrote a poem for his former lover, Marianne von Willemer. He found the heart-shaped Ginkgo Leaf suitable for the symbolic interpretation "one and double." When the ode to his love was written back in 1815, the tree that served as his inspiration stood on the castle grounds in the city of Heidelberg, Germany. Unfortunately, the tree no longer stands, but the poem is still with us as a reminder of his two creative muses. the right answer to these questions. Eddy F. Mueller. . . . . . the creator of Ginkgo Garden, gained his musical experience in the early eighties, working from is home base of Hagen, Germany, with various rock bands including Nena ("99 Luftballons"). Being a guitarist and keyboardist for a number of groups helped him to fine tune his craft as a live performer and song- writer, later finding the recording studio to be his ultimate instrument. Under the pseudonym of Birdy, Eddy has produced 11 albums, the music of which has been in more than 2000 films, videos and television commercials. Inspired by the German documentary, "Ginkgo, Leaves Of Hope," Eddy created this musical enterprise, Ginkgo Garden.